On the first weekend of March, area golfers can purchase their 2012 Golf Season Pass at 5% off the 2012 rates! During this sale all pro shop merchandise will be offered at inventory blowout prices to help golfers get ready for the 2012 golf season. Gold shoes are 50% off regular price! Shirts as low as$9.99! Interested golfers can also sign up for leagues, purchase their Permanent Saturday and Sunday Tee Times and receive information about our 2012 Tournament Schedule and League Programs. The purchasing of your 2012 Golf Season Pass at a 5% discount in ONLY available for the first weekend in March. Starting March 5th Season Passes may be purchased in the pro shop at the posted 2012 Season Pass Prices. 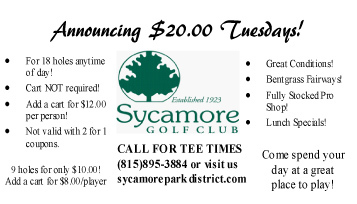 Sycamore Golf Club Announces $20 Tuesdays!